Last week, the market “celebrated” an infamous anniversary. 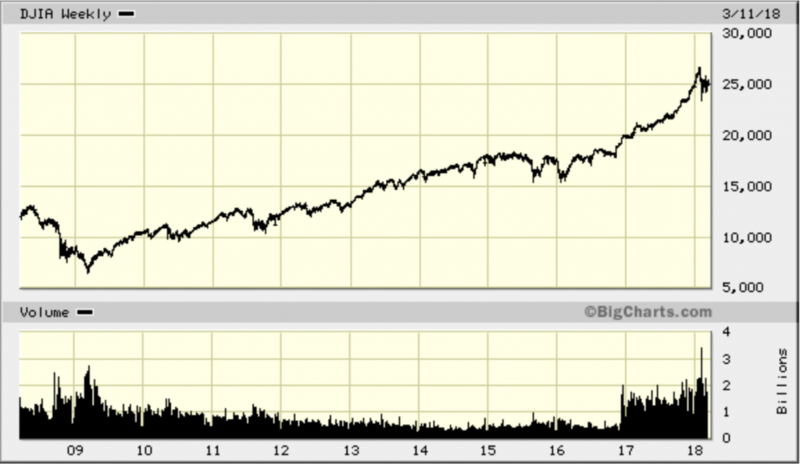 You see, it was March 9, 2009, when U.S. stocks hit their recession low. The Dow Jones Industrial Average dropped to 6,547, a level not previously seen since April 1997. The S&P 500 fell below 700, which was a 13-year low. Now, that’s an anniversary that you might have wanted to forget, but you shouldn’t. The reason why is what’s happened since, as the Dow has vaulted some 280% in the succeeding nine years. Unfortunately, many investors missed out on a lot of that upside, and many more continue to let one huge factor keep them from achieving their goals. That’s because fear tends to translate into paralysis. And paralysis means investors hold on to way too much cash while also being far too reluctant to put money to work in great companies because they think stocks are going to descend into another pernicious bear market. And while the potential for a correction or a bear market is always present, that’s no reason to stash your money in the mattress. This last uncertainty, brought to my attention by Tom Essaye of the Sevens Report, is a growing concern for markets, as the smart money sees administration Globalists (Gary Cohn and Rex Tillerson) as those who essentially don’t want to rock the economic boat, which is good for markets (at least in the short-term). Generally speaking, these are the proponents of the status quo on trade and economic policy, and the status quo has been good for investors. Of course, both gentlemen are no longer part of the Trump administration. As for Protectionists (Peter Navarro, Mike Pompeo), these men are perceived by Wall Street as wanting to rock the economic boat. And, they’re doing just that in the form of tariffs, reciprocal taxes and other tough trade measures. Now, while some may argue that these measures will be great for the U.S. economy in the long term, for financial markets, they’ve caused, and will likely continue to cause, more volatility. Yet despite these current fears on Wall Street, I caution you not to let fear rule your decisions. If I let fear dictate the investment decisions in my Successful Investing advisory service, my subscribers and I wouldn’t have enjoyed the very big gains we’ve achieved over the past year. The bottom line is that there are always reasons to be cautious about corrections and bear markets. Yet the important lesson of the March 9, 2009, anniversary is that markets are resilient, and over time the bull has always proven the bear’s master. Investors who remember this will win… and those who let fear win will lose. So, don’t be a loser. Choose to conquer fear. Known as “The World’s Largest Gathering of Free Minds,” FreedomFest takes place from July 11-14, 2018, at the Paris Resort, Las Vegas, NV. Dr. Skousen and I will start the summit with a special session of our Fast Money Alert service, revealing our winning formula for successfully maneuvering through the treacherous marketplace, by using our own special brand of fundamental and technical analysis. 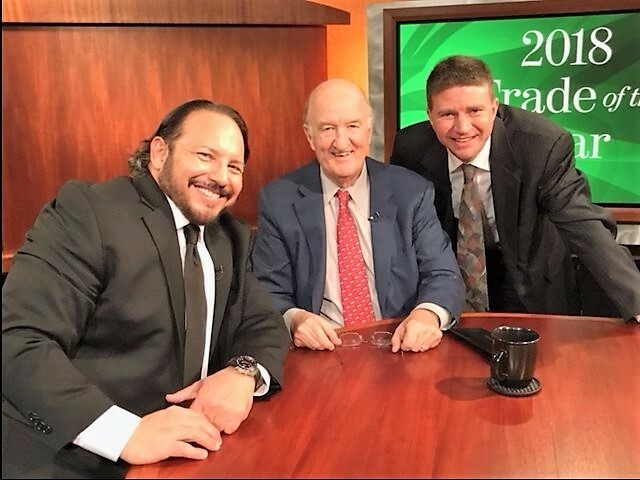 Then you will meet with our experts in the “Eagle’s Nest,” a designated room for subscribers, and hear them reveal their most valued secrets to make you a much better investor and speculator. Roger Michalski, Eagle’s publisher, will be the moderator. Early this morning, the world got the sad news that physicist and science ambassador extraordinaire Stephen Hawking had died. I recall reading Hawking’s “A Brief History of Time” in 1989, and I still remember it as a mind-expanding experience. Perhaps even more mind-expanding was the way Hawking lived his life. Despite near-complete physical debilitation due to ALS disease, Hawking fought through it to provide the world with increased knowledge on the ultimate questions in cosmology. I suspect one reason why Hawking was so productive is that he always kept a child-like attitude toward learning. The quote above shows Hawking’s “childish” thirst for knowledge. It also shows the deep humility characteristic of so many brilliant minds. So, thank you, Stephen Hawking, for never growing up. This commodity ETN is often used by investors for diversification purposes, and subsequently, creates a picture of the importance of various commodities in the world economy.